Susan is a 50+ blogger who is well-known for her passion for Paris, her love of neutrals and scarves and her penchant for light travel packing. Let’s find out more about each of these as well as her fabulous style! Hi Susan. Thanks for taking the time out to answer a few questions for 40PlusStyle.com. I’ll be 58 in March, and married 20 years in March too. I work full time as an administrative professional, and we have a 17-year-old son with mild cerebral palsy and cognitive disabilities. We also have two dogs who are a little neurotic but we love them. I love to: travel, read, write, walk, enjoy the outdoors, listen to music, enjoy art in any setting, and visit Paris whenever we can. I’m 57, will be 58 in March. Can you tell us a bit more about your blog Une Femme d’un Certain age and why you created it? I started the blog in 2007 right after turning 50. I was frustrated by trying to find clothing that was stylish, at a time when it seemed as though everything in stores was either designed for teenagers or conversely, retirees. Style and lifestyle blogs were beginning to take off, but they all seemed to be geared toward younger women. I hoped to start a conversation about style for women over 50. Over time the topics expanded to include travel, food and beauty. As the name suggests you are a great fan of France and Paris. Why do you love it so much? When I was a child, watching classic movies on TV like “Funny Face” and “An American In Paris,” and even “Gay Purr-ee” I developed a very romanticized view of Paris. I’d dreamed of traveling there since I was a child, and finally had the opportunity not long after my 50th birthday. While the reality wasn’t a movie set, being there hasn’t lost its magic, and we’ve now visited several times. What I love about Paris (and France) is the sense that everyday life should be savored and enjoyed. There’s amazing art, yes, but even with regard to buildings, parks, shop windows and public spaces there’s such an emphasis on aesthetics, on making everything delightful to look at. The food is amazing. There’s also an appreciation of the feminine, not just of women themselves but a deeper sense of those overall qualities we often associate with the Feminine (beauty, sensitivity, creativity) that seems to be valued so much more there. You are a great proponent of traveling light and packing a smart capsule wardrobe? Why is this important to you and what tips can you give 40+ women for packing for trips? When we first began traveling we REALLY overpacked. We lugged around huge bags that we could barely lift ourselves, and I hardly wore 1/3 of what I packed. I was determined to travel not only lighter but *smarter* and now I’m able to travel with no more than I can carry and lift myself. It’s a great sense of freedom! My main tip would be to stick to neutrals for the majority of pieces, and to stick to lightweight pieces that can be layered and that are washable. How do you recommend dressing for Paris? The absolute, most important thing is to have shoes that are supportive and comfortable to walk in for hours, because you will. Be sure the soles aren’t too thin as you’ll be walking on gravel and cobblestones in places. I tend to stick to simple outfits without a lot of bulk, and use scarves and accessories to accent. If you don’t want to stand out, avoid bright splashy prints and lots of bling. I never feel out of place there in black, grey or navy, and again if you want to add some color, scarves are the way to go. You are also well known for your love of scarves. Why are they so important to your style? What are your best tips for women who have yet to discover the beauty and versatility of scarves? I’d suggest starting with scarves that aren’t slippery, and are made of a fabric or knit that has a bit of “grab.” They’ll be easier to arrange and will stay put. Then just practice, practice, practice. Find a few arrangements that work with your style, and that you can do without a lot of complicated steps. I think un-fussy arrangements look best, but it’s really a matter of your style and personal taste. “St. Germain By Way Of West L.A.?” I’ve found that standard descriptions will mean 5 different things to 5 different people, and I go through phases where I might lean more classic or bohemian or something else entirely. Simplicity, neutrals, and a mix of softness and structure. Especially because I’m so short, I avoid a lot of visual clutter and bulky fabrics or styles. I tend to stick to a long-over-lean silhouette, but will occasionally mix that up. Los Angeles. I’ve lived in California all my life, and while we don’t actually live in beachwear despite what some believe :-), there’s a certain casualness here. Anything really stiff and “buttoned up” feels out of place in most venues. Most of the time, yes. It’s taken me a while to get there. I like to mix masculine and feminine, casual and dressy/structured within an outfit (like boyfriend jeans with a blazer and heels). Black makes me feel grounded, and I wear a lot of black. Most days I have to dress in a way that’s appropriate for the office, so that’s my first consideration. Our office is casual, but I do want to look put-together and like I’m there to work. I look at style blogs, Pinterest, and magazines, and try to take inspiration and tweak it so that it works with my life, either for work or off-duty activities. Yes and no. I’ve had my “colors done” three different times and with three different results. I have a sense of what colors work for me, but love wearing black. I’m short but curvy, and find that open necklines, longer tops and narrower bottoms tend to look best and most balanced on me. Absolutely. I used to wear suits for work, and more “classic” styles. But at a certain point, the classics started to feel too staid and stodgy on me, and I’ve gradually shifted toward simpler and “softly structured” styles with a bit more movement. I’ve come to the conclusion that there isn’t a universal standard of “age appropriate” style. It’s all about personality, lifestyle and what feels right to any woman at any point in her life. 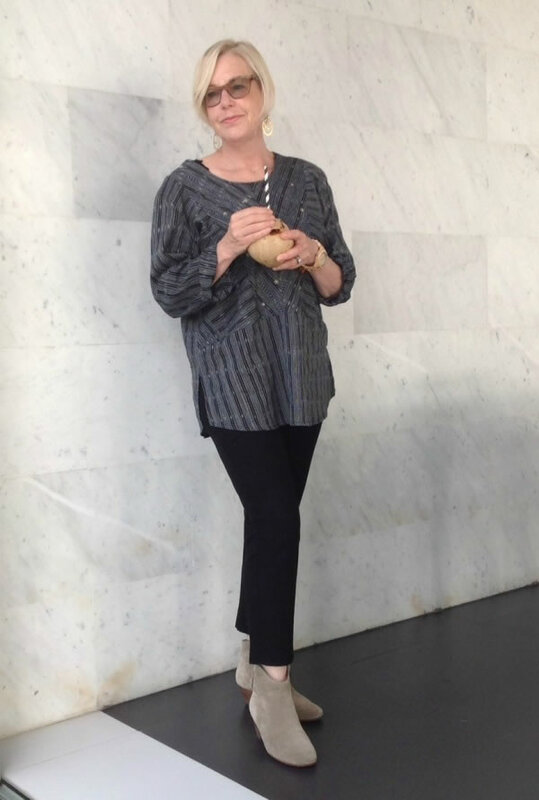 I trust that sense of whether something looks and feels right when I first put it on more than any arbitrary standards of “age appropriateness.” Dress your sense of self, not an age. More interested, actually. I enjoy the creativity of expression through style, and have more confidence and sense of myself and what works than I did when I was younger. Oh, that’s a tough one because what I like tends to shift over time. Right now I’m liking the variations on my black-top-blue-jeans outfits like this one and this one. I see trends as an opportunity to both selectively try something new and replenish favorite styles that have come back around again, but I don’t see myself as a particularly trendy dresser. Currently I’m thrilled that flats and lower heels have gained popularity recently and will not miss the teetering platform stillettos we’ve been inundated with the last few years. Figure out what appeals to you, then find ways to make it work with your body and lifestyle. Don’t feel you have to start dressing a certain way just because there are a certain number of candles on the cake. Invest in those basic wardrobe items that you’ll wear the most, and buy the best quality that you can afford. Take care of your shoes. Right now, my plan is just to keep it going in the same format. I’d love to have more time to do some writing, so maybe when I retire in a few years I’ll expand the scope a bit. Things move so fast now, that who knows what format it might evolve into over the next years. I so enjoy the community of bloggers that has developed, and has become the most enjoyable and rewarding part of blogging. Sylvia, thanks so much for including me! I’m very flattered and honored. Note from Sylvia: Thanks so much for your inspiring answers Susan. 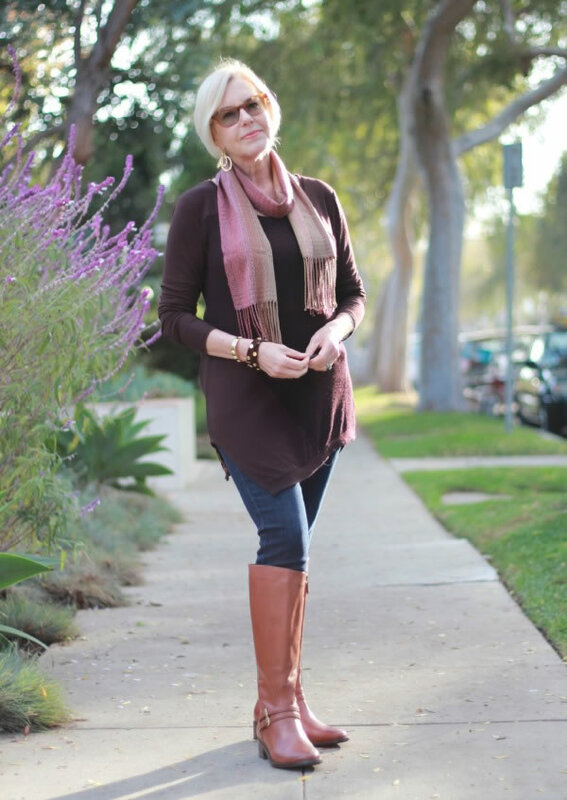 Now go check out her fabulous blog Une Femme d’un certain age! Which of Susan’s outfits is your favorite? It sums up everything about dressing at any age. Great interview of Susan, who I have followed and enjoyed for years. I admire her style and her writing. I just realized that I missed the interview of Josephine, of Chic At Any Age. I met her in Nice in October, and found her to be very interesting and kind. Meeting bloggers is part of what makes blogging vibrant. 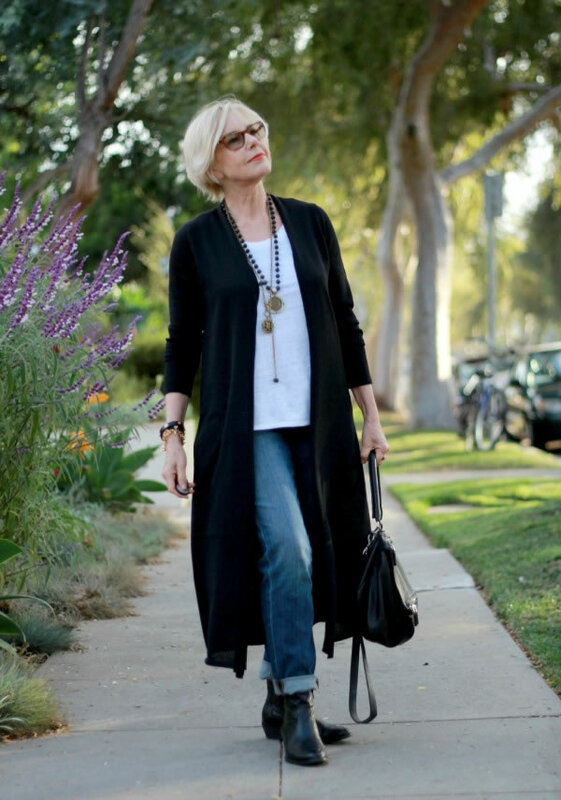 Susan has been such an inspiration and leader in the quest to show that older women can have a very unique and innovative take on style. I came across her blog awhile ago and it showed that there is a market and an interest for this kind of content. Thanks for leading the way. Thanks for sharing Susan’s story with us Sylvia. I like the simple lines, easy neutral colour mixing and how she dresses to suit her shape so well. I can see French influence in her choices of outfits and will look forward to reading her blog. Wherever did you find those precious beige booties? I have been looking for some. Lovely interview. Susan sure knows how to dress perfectly for her body and mind. You can tell she is her own woman the moment you set eyes on her. Looking very elegant (that is something I have to work on haha). Next post: A closer look at In Good Company – one of my favorite labels in Singapore!